Thanks for visiting A Smitten Kitten Grooming! Where you will have a groomer who loves and adores cats! Your cat's comfort and safety are my number 1 priority, 2nd is to give them the best grooming and make them feel like a million bucks! You will be Smitten with your Kitten, You'll see! A Smitten Kitten, is focused on providing high-quality service and customer satisfaction - We have been grooming cats & dogs for over a decade and knows it is in the pets best interest to be groomed somewhere that has the lowest amount of stress to the pet, it's own home. My grooming trailer is a grooming salon on wheels! I come to you and groom your furry friend right outside your home. I provide convenient, low stress grooming for you and your pet. I come to you and groom your pet in my mobile grooming trailer. your pet too purr-fection & with all the comforts of a warm spa experience. Mobile grooming is a specialized luxury service and is the best choice for Cats especially. to be groomed along with many other pets waiting for their turn. no cross contamination for fleas, or any illness's to be spread. Let me show you how fantastic Mobile grooming truly is! Most pets are done within an hour to 2 hours. 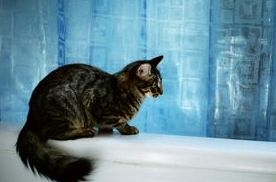 In spite of their reputation for tolerating only dry land, many cats are actually water lovers. 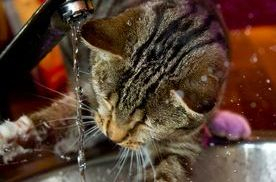 Some like to play in standing water, whereas others are fascinated by running water and prefer to drink from a faucet. Most female cats are right pawed while males are left pawed; a cat’s brain is more similar to a human brain than to a dog’s brain; cats can run at an astounding 31 mph for short distances; and, cats almost never meow at other cats – only at humans. Have you ever heard of a swimming cat? Not all cats Hate the water. Many do, some don't seem to mind, and others actually do like it. The Turkish Van is one such breed of cat. In fact its nickname is "the swimming cat".